Without a doubt, our dog Dart’s favorite activity is getting away from the house and hanging out with the boys. He doesn’t care if it’s walking to the mailbox to get the mail, going on a walk around our neighborhood or running alongside them while they longboard – he just loves spending time with them. Like most dogs, ours is all about spending time with his people. Last week the boys decided to take him longboarding and over to a river that’s near our house. Given the fact that most of Dart’s days are spent sleeping, he was so excited to get out and explore. Would you like to see their little adventure? Here’s a video we shot, some of which we used a GoPro to get Dart’s perspective. Yep, I think they all had fun! This is our first family dog and we’ve had him since he was 6 weeks old. I guess over the past year, we’ve noticed Dart’s aging. He’s not able to jump up on things like he used to, he’s started barking more (at nothing!) simply because I think he can’t see as well as he used to, and some of his favorite activities aren’t quite as exciting as they used to be. One thing he used to love to do that we can’t get him to do anymore, is run around our living room in circles over and over again. It was pretty hilarious to watch and I can’t even remember the last time he did that. 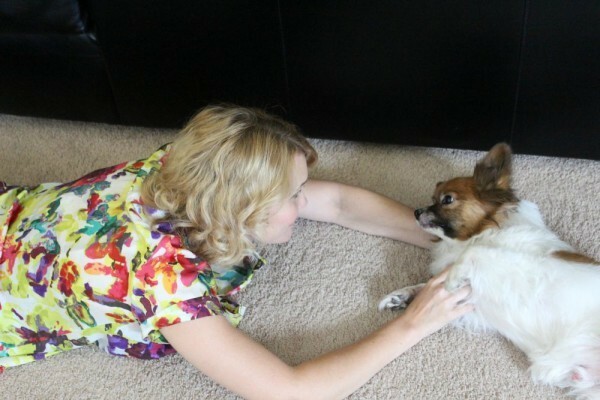 According to experts at Purina Pro Plan, at around age seven, the glucose metabolism in a dog’s brain begins to change. What can that affect? It can affect their memory, learning, over-all awareness and even decision making. Purina Pro Plan has discovered a way to help promote alertness and mental sharpness in dogs, ages seven and older through nutrition and have released their Purina Pro Plan Bright Mind line. When owners add this to the daily diet of their 7+ dogs, formulas that contained enhanced botanical oils promoted memory, attention and trainability. 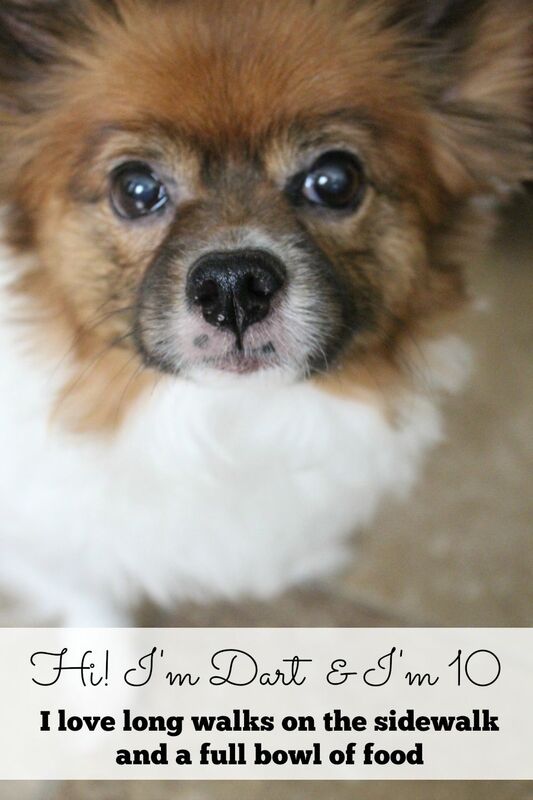 Did you know a dog is considered senior by the age of 7? I had no idea and would have been more aware of the food I was feeding our dog if I knew this information. 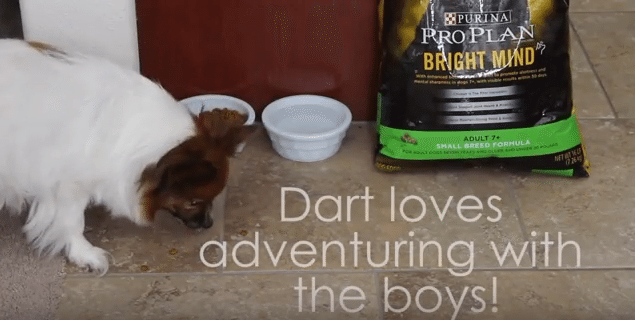 As we shared with you already, we took Dart to PetSmart to purchase the Purina Pro Plan Bright Mind for small breeds. He’s been eating it for a month now, and all five of us have noticed he seems to be rediscovering his favorite activities again. He loves to run to the front door and then run under the desk in our living room. We’re pretty sure he’s playing hide and seek. Another thing he loves is when we throw a blanket over him. First, he just sits there completely still. And then he slowly crawls out beneath it, but only pokes out his head. He has a thing for blankets and will find one anywhere, at anytime to snuggle with. Now if you Spend $10 on any Purina Pro Plan Dry Dog or Cat Food* at PetSmart between 8/31 and 10/4, you can save $10 on your next Purina Pro Plan Dry Food purchase, 14-lb. or more, on or before 11/1. What are some of your dog’s favorite activities? I would love to hear how you spend time with your furry member of the family.